I have stumbled across a wonderful e-Learning wiki in the past few days called the e-Learning Classroom, and as a result I am now really having a close look at my use of classroom space, and what this says about my pedagogy. So after school yesterday I got rid of it! My desk that is. I've replaced it with a smaller desk, the same as the students have, just so I have somewhere to keep my laptop off the floor, and to stash a few stationery items. As a result, I have instantly created space which I can now consider how to use. I still have the office style swivel chair, but am thinking that it might be more effective to get rid of that - at least during class time, so that I can be mobile in the classroom, actively moving around, supervising, assisting and, well, teaching. Maybe this is 'm-teaching', where the 'm' refers to the teacher, not the device. What I'd love to do next is try to open up the classroom by doing away with as many of the students' desks and chairs as possible - perhaps replacing them with low coffee tables. It seems to me that a lot of children enjoy working on the floor anyway, and it would create a level of flexibility that I don't have at the moment. I have put out an email to my parent community, as well as other stuff members, to see what surplus furniture might be lying around. Come to think of it, this could be a class project - they could, in groups, raise a small amount of money, which could be used to source a cheap table on TradeMe, something on $1 reserve. It probably would not take too long at all, or cost too much. And imagine how much more space I would have without 27 desks and chairs! The use of coffee tables, sofas, armchairs, perhaps the odd round dining room table for those who prefer chairs - what does this remind me of? It seems almost like a recreation of the dining/living area of a home. I think this is good. The living room is a space that most students will associate with relaxation, family, informality - which incidentally are ideal conditions for learning. If learning is about living, and living is about learning, then why not try to transform our 'class' room (what does that tell us, anyway???) into a 'living' room. So, a work in progress. Watch this space! Such a great journey to undertake! I moved to my current school 2 years ago where we have a shared office space. It's amazing how more mobile you become when you don't have a desk in the classroom. Also our Year 5/6 classes have removed all the 'traditional' table and desks in favour of the type of furniture you are talking about. Bean bags, single desks, kneelers and more now adorn the classrooms. The kids seem to really enjoy it. I look forward to seeing how your journey goes! Thanks for your comment, Amanda. I'm really excited about it too - the first of our cushions arrived today, and I have a coffee table lined up, with feelers out for a few more. 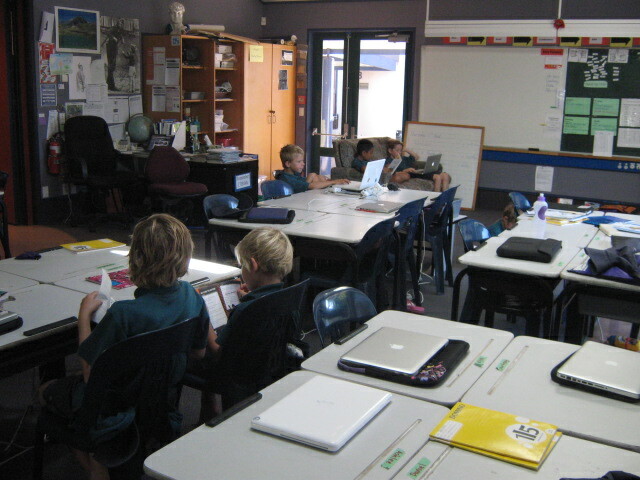 The class are excited by it, and seem to like 'The Living Room' concept (that's the new name of our class wiki, too). Craig, our new library hosts a lot of the furniture options that you suggest in your post, and I saw a lot of similar ideas in action in the classrooms at Silverton Primary School, Melbourne, when I was there as part of the Microsoft Innovative Schools program. I teach in a building with upper primary classes (Year 6/7) and we have round tables in the main classrooms with stools, cushions and low tables in our shared central learning space. The kids have warmed to the concept very well, as they have the options to choose the place that suits the task or learning at hand. For me, as teacher, it means letting go of traditional ideas like fixed seating arrangements. We have used IKEA furniture with the mindset that it isn't built to last and can be updated as the needs of our students change. We have also used a small minimalist desks for our teachers - as you have said, a place to dump our laptops and essentials. It will be cool to see how you go about transforming your classroom. Thanks for your comment, Graham. I've been following your updates over the past year or so about your building design, as our school is about to start a massive rebuild die to leaks. It's so true that the learning space design says a lot about how we view the process of learning, and does involve a letting go. Since discarding my desk I've caught myself thinking "Where's my little island gone?! ", but it's a good change that puts me out there in the room actually teaching and giving feedback etc.